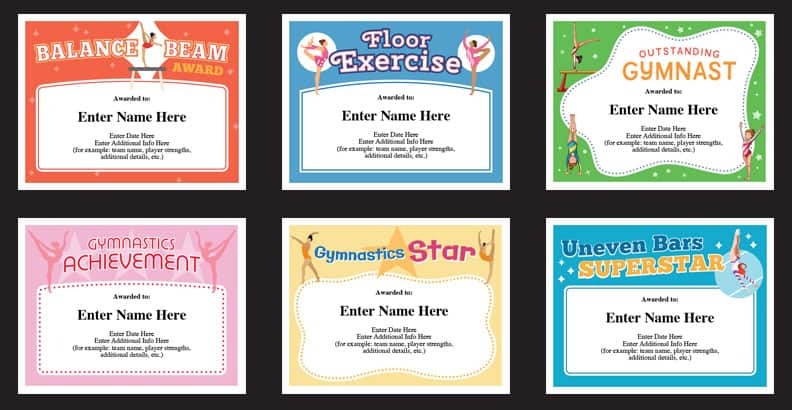 Gymnastics Certificates Templates – Recognize your favorite gymnasts with these colorful and design-oriented certificates. Personalize each certificate with the gymnast’s name, team name, coach’s name and highlights of the award. These are great to award after a meet or at the end of the season. Create some lasting keepsakes for your gymnastics team with these stylish certificates. With six certificates to choose from, you’ll find something for everyone. Distinguish between the same certificate with the highlights listed on each in the text fields provided. Gymnasts love to receive words of praise and what better way to say them than with some snazzy certificates. Suitable for framing, but inexpensive enough to give out dozens each year, year after year. Gymnastics coaches and team parents may elect to hand out certificates at the conclusion of each meet or at season’s end. The choice is yours. Learn more about the sport of gymnastics at USA Gymnastics. Kids love certificates. Perhaps most importantly, an award of any type helps instill confidence which is so critical for young athletes. Read more about Confidence is King in Youth Sports. The certificates provide a great way for athletes to remember a fun season. And, lastly, it should help gymnasts want to come back for next year’s season. 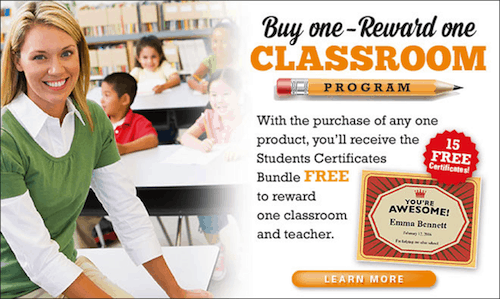 Purchase the Gymnastics Certificates Templates, and receive the Classroom Bundle FREE!